There are few countries that could lose a reigning Olympic gold medallist and Olympic record holder and still be highly confident of retaining the title. 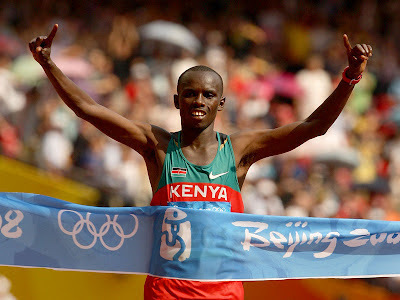 However, despite the tragic death of Sammy Wanjiru, Kenya will be supremely confident of taking the gold medal in the men’s marathon at the upcoming London Olympics. Over the years, the marathon has been dominated by the Ethiopians. Ethiopia has produced some of the greatest long distance runners of all-time. The likes of Abebe Bikila, Mamo Walde and Haile Gebrselassie are legendary names in the marathon. However, their neighbours, Kenya, have been striking back. Last year, the twenty fastest times in the world were all set by Kenyans. They won every big city marathon, setting course record in all the major marathons. Just to underline their dominance, they took gold and silver at the World Championships in Daegu as well. To give an idea of the depth and quality of Kenyan marathon runners at the current time, almost 300 have bettered the IAAF A-qualifying entry time. To put this into comparison, Australia currently have one athlete that has matched this time. The roster of marathon runners that they have at their disposal reads as a who’s who of long distance running right now. The biggest problem for the Kenyan selectors is not finding potential medallists – rather it is which of the world-class athletes that they will leave at home. For the Olympics, each country can only enter three athletes into the marathon. The Kenyans have already selected two of the three athletes – the other will come from a remaining four-man shortlist. However, there are already some top names that have missed out on fulfilling their dream. 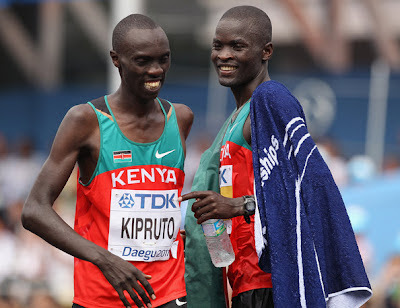 Vincent Kipruto and Roberto Kiprono Cheruivot are two such athletes. Kipruto finished second in the marathon in the World Championships last year in Daegu and in 2009, he won the Paris marathon in a course record time. Cheruivot won the 2008 Frankfurt marathon and the 2010 Boston marathon, the latter in a course record time. However, neither of these two athletes was deemed good enough to make the final shortlist. The two men that have already been selected are Patrick Makau and Abel Kirui. Patrick Makau is the current marathon world record holders, which he set in the 2011 Berlin marathon. His time of 2:03:38 still stands, although is expected to come under pressure at the Olympics this summer when all the top names meet. 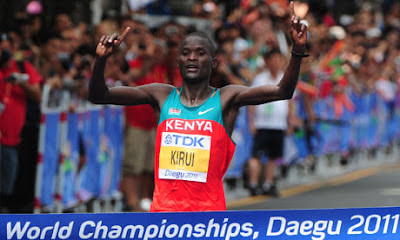 Abel Kirui is the a reigning two-time world champion, having won the title in both 2009 and then in Daegu last year, where he beat Kipruto to the gold medal. However, there is intense competition between the other four hopefuls – four men who would walk into any other country’s selection in an instant. Those four athletes are Wilson Kipsang, Emmanuel Mutai, Moses Mosop and Geoffrey Mutai. Although, as we run through their impressive resumés, remember that had Sammy Wanjiru not tragically passed away last year, none of these would be going to the games. Wilson Kipsang currently stands at number two in the list of the fastest marathons of all time. 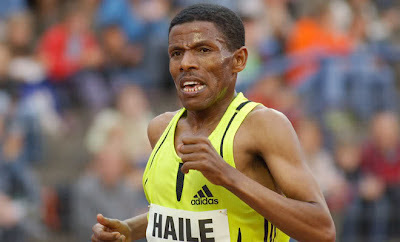 His 2:03:42 time at the 2011 Frankfurt marathon is only four seconds off Makau’s world record time. He gave his hopes a major boost by winning this year’s London marathon, beating Kirui by over three minutes. However, he is still not guaranteed a place at the Olympics. 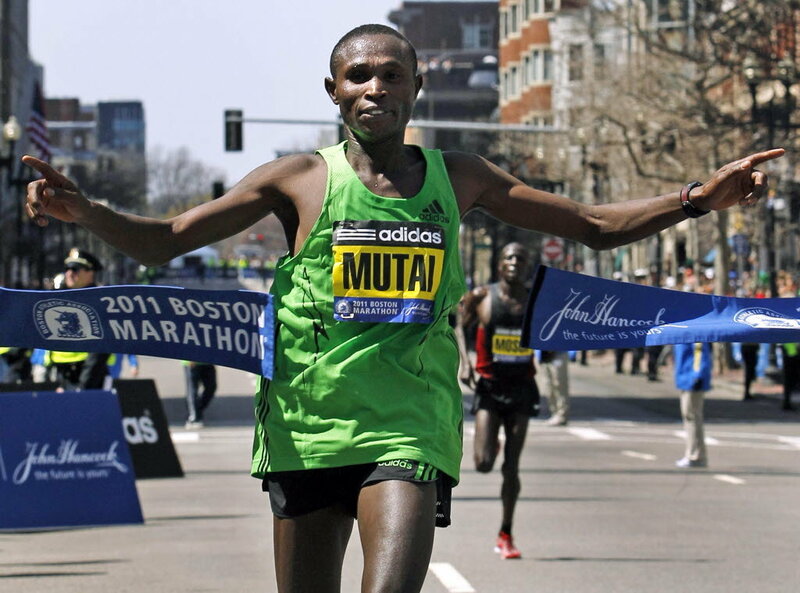 Emmanuel Mutai is the seventh fastest man in history with a personal best time of 2:04:40. He has a silver medal from the World Championships in 2009, and has experience of running in London, given he is the 2011 London marathon winner and course record holder, although he could only finish seventh this year. Again, he is not guaranteed a place at the Olympics. Moses Mosop technically has the second fastest marathon time in history, although it is not officially recognised due to the nature of the Boston course that he set it on. However, his time of 2:03:06 is still hard to overlook. He is also the currently reigning champion and course record holder of the Chicago marathon. And finally, Geoffrey Mutai. He beat Mosop in the 2011 Boston marathon in the fastest ever time in a marathon, but as with Mosop, one which is not officially recognised. His time of 2:03:02 would have smashed the world record by 36 seconds, although this was undoubtedly aided by the nature of the course. If we ignore that, he is still the tenth fastest man in history and the only man to have ever won the Boston and the New York marathons in the same year. Only one of these four men will run in the Olympic Games this summer. A fact which means that three of the greatest marathon runners of their generation will miss out on the pinnacle of their sport. Despite all this, Kenya are still not guaranteed the gold medal in London. Unimpressed at the recent dominance of their neighbours, the Ethiopian athletes have raised their level as we near the Olympics this summer. Eight of the top twelve leading times this year are currently set by Ethiopians. The top three times, set by Ayele Abshero, Dino Sefir and Marcos Geneti were all sub 2:05:00 times; indeed, Abshero’s time puts him just outside the top five in the fastest men of all-time. The one thing we know for certain is that we will have a new Olympic champion. Sammy Wanjiru became the first Kenyan to win gold in the Olympic marathon four years ago, and it is a tragedy that he will not return to defend his crown. His death still remains a mystery – whether it was suicide, murder or an accident. However, he has undoubtedly inspired a generation of Kenyan marathon runners. Even without him, the quality of the field come London will be immense. As the two East African nations go head-to-head, it will be a battle of the old masters and the young apprentices. Ethiopia has dominated the event for as long as it has existed, but the Kenyans have come to take control and usher in a new era. Big news today, Makau is ditched.